Robin – we are not sure about the ESA policies of your airline. Many foreign-based airlines will only recognize ESAs on the leg of the flight originating from or terminating in the USA. If this is not permitted, then likely your cat will need to fly in the cargo hold and it will need a transit permit if it will change aircraft in HK. (you can tell that there is an aircraft change if the flight numbers change). You should absolutely discuss your cat’s transport with your airline. 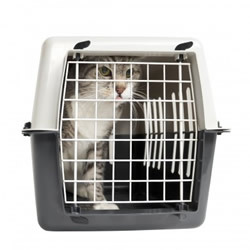 As all live animals must arrive in HK as air cargo, it may be required that your cat transit as air cargo. Your airline can give you additional details. I am planning to bring my cat from USA to Taiwan. I will have a layover in Hong Kong. A direct flight is unavailable. I have gotten the rabies titer results and they are acceptable. Can you help me with the next steps and tell me how soon I should notify the airline? I have flown with this cat before (on short flights) as a emotional support animal. Can I do this for an international flight with the same documentation? Miranda – it is our understanding that pets can enter China at the following cities with home quarantine: Checked Baggage or air cargo: Guangzhou, Chengdu, Hangzhou, Zian, Dalian and Shenyang. That said, we would suggest that you contact an agent in China to confirm as also to see if they can arrangen for the import of your pets to Beijing with home quarantine. An agent in China is helpful as they are familiar with local practice. (we are in the US). You can search for one at IPATA.org. Hello! I have 2 large breed dogs to fly from the US to eventually end up in Tianjin, China. Can you please suggest a route and near destination that I’ll not have to quarantine them? Or at least mostly a home quarantine as we are planning to relocate our home there. Thank you in advance. Daniel – obviously, the dogs will need to clear customs at SEA and an agent (or broker) is required to clear them and put them on a flight to MSO. It is unclear why things have changed if you are using a US-based customs agent (or broker) who will clear them and check them on a flight to MSO. You may want to search for an agent who serves SEA and inquire. You can find one at IPATA.org. I am in Missoula MT (MSO) and trying to import a couple pups and adult dogs from Frankfurt. I am being told I would have to ship to Seattle (9 hr. drive one way). Only 2 yrs ago I was able to do the same thing with a broker used at port of entry airport and the dogs were the flown right into Missoula. What I am not doing right this time? Lroi – we are sorry that your airline did not service you properly. We would note that if your pets were flying as air cargo, the airlines will not guarantee that your pets will fly on the same flight as you. We hope they got to your destination safely. Melanie – the airlines will only transport pets in the cargo hold when the temperatures are below 85 degrees. Three options that may work. Select a flight that departs very late or very early in the AM. Also, check with United to see if they can fly the route as they offer additional protections for live animals during the summer in select airports. Fly out to Palm Springs to pick up the puppy and fly it back in the cabin. Just wanted to ask about international flights and importing. What would be the deal with going from the UK to Las Vegas with a dog in cargo in Late May?